Amazon this morning took the wraps off of their new video streaming and entertainment device, the Amazon Fire TV. Fire TV is a $99 streaming HDTV device, that like an Apple TV or Roku, does a bit more. 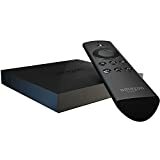 Sporting a modern and intuitive looking interface and a little remote with a microphone (for voice commands), the Fire TV combines popular entertainment apps such as Netflix, Hulu Plus, Pandora with Amazon’s own services such as Amazon Instant Video. They are planning on rolling out a kid-friendly Amazon FreeTime service in the near future. The device can output up to 1080p HD video and Dolby Digital Plus 7.1 surround sound, and is stocked with 2 GB RAM, a quad-core processor and a dedicated GPU. The Fire TV also plays Android-based Kindle Fire games such as Minecraft Pocket Edition, Riptide GP 2, The Walking Dead, Asphalt 8 Airborne, and original content such as Sev Zero. Amazon also has a $40 Amazon Fire Game Controller ready to go, which includes 1,000 Amazon Coins to pick up some games. Check out a few product shots and make sure to check out all the details on Amazon’s Fire TV product pages.